Supply and demand functions play a crucial role in economics. 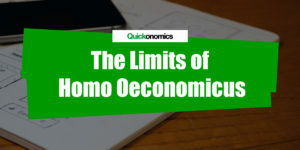 They help us analyze and understand the most fundamental economic concepts and issues (e.g. the law of supply and demand, calculating producer surplus). For the sake of simplicity, we often assume them to be linear, which makes it much easier to calculate them. Thus, in the following paragraphs we will take a closer look at how to calculate a linear supply function. 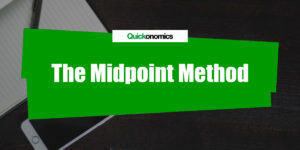 Fortunately, we can use the same four step process we use to calculate a linear demand function, with a few subtle differences: (1) Write down the basic linear function, (2) find two ordered pairs of price and quantity, (3) calculate the slope of the supply function, and (4) calculate its y-intercept. In its most basic form, a linear supply function looks as follows: y = mx + b. In this case, x and y represent the independent and dependent variables. Meanwhile, m shows the slope of the function and b represents its y-intersect (i.e. the point where the function intersects the y-axis). To illustrate this, let’s calculate the supply function of an imaginary candy bar factory, called SuperCandy. We will call the function Qs, with P being the price of candy bars in the market. Hence, the basic linear function in our example can be written as: Qs = mP + b. 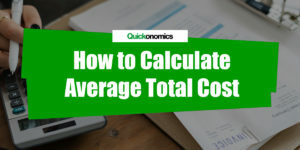 To calculate a linear supply function we need to know the quantities supplied for at least two different prices. This allows us to create what we call two ordered pairs (x1,y1) and (x2, y2). Note that each of these pairs represent the x and y coordinates of a point in the supply and demand diagram. You will usually find the information needed to create these ordered pairs in statements like “at a price of x, sellers are willing and able to sell y units of good A” or “when price rises to x, supply of good B increases to y”. Going back to our example, we can say that at a price of USD 2.00, SuperCandy is able and willing to sell 500 candy bars. Meanwhile, at a price of USD 1.00, the company will only sell 250 bars. With this information we can create two ordered pairs (2, 500) and (1, 250). With the two ordered pairs and the basic linear function, we can now calculate the slope of the supply function. The slope is defined as the change in price divided by the change in quantity supplied between two points (i.e. the two ordered pairs). We can use the following formula to calculate it: m = (y2 – y1)/(x2 – x1). In the case of our example, the two ordered pairs are (2, 500) and (1, 250). Thus, the formula looks as follows: (250-500)/(1-2). This results in a slope of 250 (i.e. -250/-1). Please note that – unlike most demand functions – supply functions usually have a positive slope. That means, they slope upwards from left to right. Now that we have calculated the slope of the function, we can plug that value into the initial function (instead of m). Then all we need to do is plug in the values of one ordered pair, which allows us to calculate the y-intersect of the function (by solving the equation for b). Revisiting our example, we can update the initial linear function to include the slope (i.e. Qs = 250P + b). Next, we simply replace P and Qs with the values of our first ordered pair (2, 500). This leaves us with the following equation: 500 = 250*2 + b. When we solve this for b (i.e. the y-intercept), we find that in this case b = 0. Thus, the supply function is Qs = 250P + 0 (i.e. Qs = 250P). Last but not least, we can use the second ordered pair to double-check our result. Please note that this step is optional, however it might come in handy during exams or quizzes. All we need to do is plug the values of the second pair into the supply function we just calculated and see if the equation is still correct. If we do this with the values from our example above (1, 250) we get the following equation: 250 = 250*1. As you can see, this equation still holds true. Thus, the supply function we calculated above must be correct. In economics, we often use linear supply and demand functions to make calculations. This makes it easier to work with them, which in turn allows us to analyze and understand a wide range of basic economic concepts. 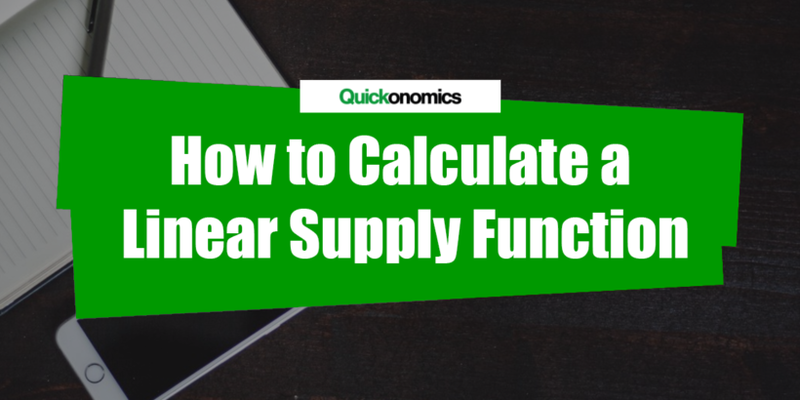 To calculate linear supply functions, we can follow a simple four step process: (1) Write down the basic linear function, (2) find two ordered pairs of price and quantity, (3) calculate the slope of the supply function, and (4) calculate its y-intercept.